My name is Alicia Stachowski and I am an Associate Professor of Psychology at the University of Wisconsin, Stout. I am working with Sue Ann Corell Sarpy on a Citizen Science Program sponsored by the National Academies of Science. We would like to share some preliminary findings from this research. In the aftermath of a disaster, communities often lack information about environmental contamination that could be used to guide prevention and recovery activities. Community-led citizen science, where lay individuals or non-experts lead or participate in data collection and research activities, offers great promise for promoting equitable, cross-boundary collaborations, fostering scientific literacy, and empowering community-based actions around environmental risks. The Citizen Science Training Program was designed to build organizational capacity and enhance community health and well-being through promotion of citizen science in coastal Louisiana communities. The training program was aimed at developing a network of citizen scientists for environmental contamination monitoring, creating avenues for communication and dissemination of project activities to stakeholders, and strengthening collaborative partnerships to enable sustainable networks for knowledge, skills, and resources. Our evaluation includes a social network analysis of the existing and developing relationships among participants. How Does a Citizen Scientist Networks Develop? We asked participants to indicate who they know, who they share information and resources with, who they discuss community issues with, who they go to for advice, and who they collaborate with. 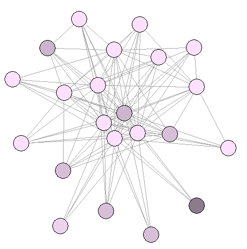 Our preliminary results illustrate an increase in ties, or connections among participants (i.e., network density). For example, respondents indicated which other participants they discussed community issues with before and after training. 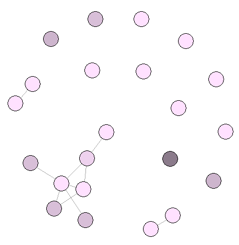 Before the survey, network density was 4% (see Figure below). Pre-training ties among participants coded by parish regarding with whom they discussed community issues with. Following the survey, network density increased to 45%. Post-training ties among participants coded by parish regarding with whom they discussed community issues with. Diversity Among Trainees. We included a diverse group of participants. They varied in age, gender, race/ethnicity, and occupations. Small Group Activities. The training included small group activities that encouraged information and resource sharing among participants. Hands on Activities/Exercises. The training included hands-on activities and exercises in using the monitoring and testing equipment. These activities/exercises encouraged active participation and interaction among trainees. Large and Small Group Discussion. The small group activities and hands-on exercises were followed by discussion among participants that allowed for exchange of different points of view. Follow-up Field Research. The training culminated with participants identifying a community-based need that they are currently addressing using the knowledge, resources, and community capacity that was enhanced by the training.